Compendium Of The Social Doctrine Of The Church. The authentic teaching on the Church’s doctrines of social justice. Here you will find a truckload of information on marriage, family, culture and society, including tons of references to authoritative Church documents and more. Vatican Website. Lots of good stuff. Encyclicals, apostolic exhortations, statements, teaching and more . . .
Catholic Encyclopedia. There’s enough information here to keep you occupied for the rest of the century. USCCB Website. Every U.S. Catholic should visit this site regularly. Catholic Online. It’s Catholic news. Got apologetics? Here’s the comprehensive source: Catholic Answers. 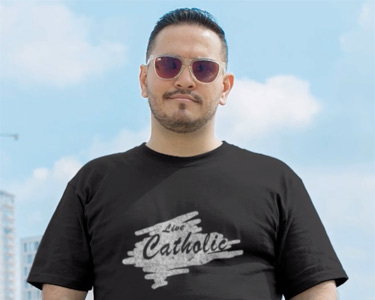 Be sure to check out their podcasts and Catholic radio. Abortion is not only a crime against the unborn, it is a crime against women, men and society. Both women and men often feel as if there is no hope after an abortion related fall. Many confess that the choice to have an abortion has inflicted irreparable damage on their spirit: they feel as if they cannot be loved; as if they have committed the “unforgivable sin.” However, God loves everyone, he calls all to repentance in order to receive the warm and regenerating gift of forgiveness. The Church is here to help. You are not alone. Want to read about the latest in modern cosmology and how scientific evidence is converging on the necessity of a beginning for all physical reality? This wonderful book by Fr. Robert J. Spitzer, titled New Proofs For The Existence Of God: Contributions of Contemporary Physics and Philosophy, also includes the latest metaphysical proofs for the existence of a transcendent, unconditioned reality: God. Want a good apologetics style book, written with brilliant cogency and precision? Here’s an old favorite of mine: Rev. John A. O’Brien. The Faith of Millions. Huntington, Indiana: Our Sunday Visitor Inc., 1963, 1974. Got definitions? Don’t miss this one: John A. Hardon, S. J. Pocket Catholic Dictionary. Abr. ed. New York: Image Books Doubleday, 1980. There is also an online version available. Are you discerning? How do you know if you are really listening to God or only to yourself? Do you sincerely want to fall in love with the Holy Trinity? And what about competent spiritual direction? Don’t miss this straightforward, must-read book for those who are serious about their Christian faith. Thomas Dubay, S.M. Authenticity: A Biblical Theology of Dicernment. San Francisco: Ignatius Press, 1977. Want to know more about Catholic spirituality, advanced prayer, and the stages of the spiritual life, culminating in spiritual marriage to Christ? Don’t neglect the unparalleled St. Teresa of Avila, Doctor of Prayer. Check out Interior Castle and Her Life by Herself, among others. On the subject of Catholic spirituality and union with God, I highly recommend Dr. Ralph Martin’s book, The Fulfillment of All Desire, available from Emmaus Road Publishing, 2006. Is Christology your subject? Don’t miss this one: Jesus Christ: Fundamentals of Christology, by Roch A. Kereszty. Feel the call to return to that wonderful, essential and life changing fullness of truth found in the Catholic Church alone? Check out Catholics Come Home. Check out the Sophia Institute for Teachers. Our Sunday Visitor has lots of good resources. Tons of great stuff is available at the Family Research Council’s website. Here’s an excellent page explicating the link between homosexuality and child sexual victimization. Lots of scholarly studies and references are cited. The Catholic Medical Association upholds the principles of the Catholic Faith in union with the Magisterium. The U.S. bishops on Ethical and Religious Directives for Catholic Health Care Services. An excellent book. It explains in a detailed and easy to understand way what morality is, and why it is important to live a life of virtue in order to live a full and happy life. With a number of case studies to help understand such questions as just war, human sexuality, marriage and so forth, Mattison writes from both a natural perspective as well as a religious and Catholic one. Mattison III, William C. Introducing Moral Theology: True Happiness and the Virtues. Baker Publishing Group, 2008. From the U.S. Bishops: Morality. Check out the Population Research Institute. Lots of excellent info here. Here’s a website with tons of info on the science of philosophy. Helpful prayers for the spiritual battle against the devil.